Modern three bedroom apartment with spectacular views & use of three community pools including one indoor. Free wifi. This three bedroom ground floor apartment has private terraces with barbecue and outdoor dining facilities and the use of three community pools, one indoor. It is well furnished and equipped. Free wifi internet access. There is an archway from the living room to the three bedrooms. The master bedroom has a double bed, patio doors to a juliet balcony and an en-suite full bathroom, with additional walk-in shower and twin wash basins. Bedroom two has twin beds and patio doors to a terrace. Bedroom three has twin beds. These two bedrooms share the use of a separate shower room with twin wash basins. Single-storey ground floor accommodation in La Manga Club Resort, fully air conditioned. Private terraces and barbecue facilities. 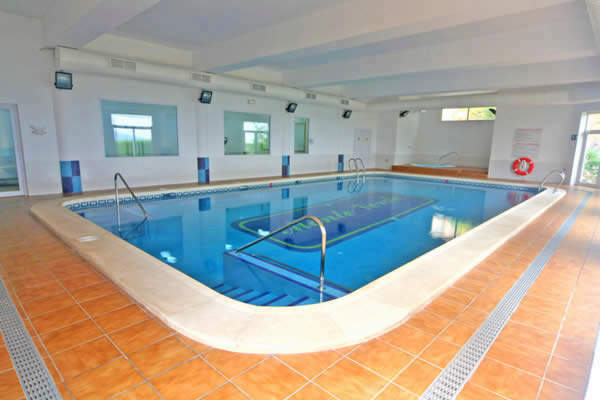 Has the use of three community swimming pools, one of which is indoor and heated seasonally.